F.N. SLINGSBY commenced the manufacture of training type gliders in 1931 at Scarborough. 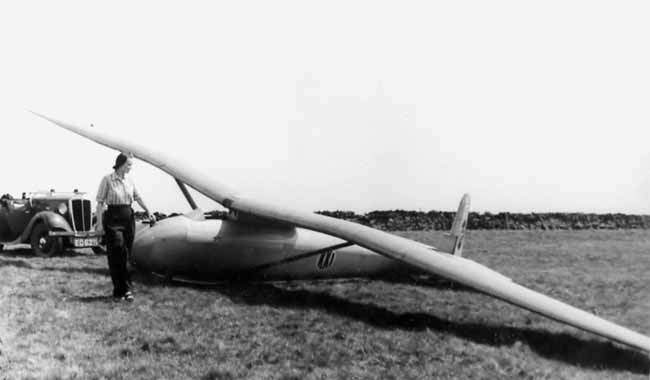 In 1932 on the personal advice of Gunther Groenhoff (who visited the Scarborough Gliding Club to lecture and instruct in the art of soaring), Slingsby built and piloted the British version of the “Falke”, known as the “Falcon”. 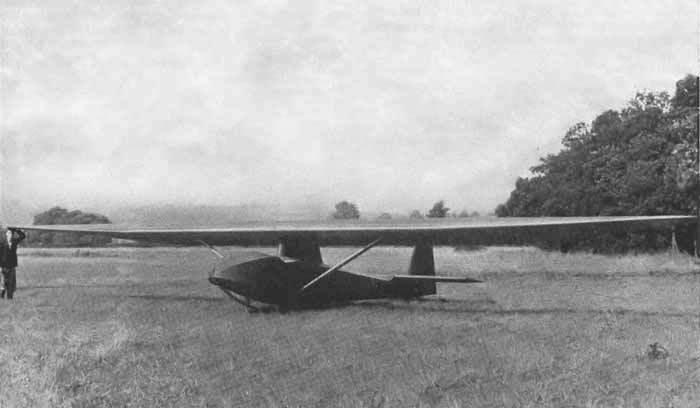 This prototype appeared at many gliding meetings throughout the country and contributed to the advancement of soaring in Great Britain. 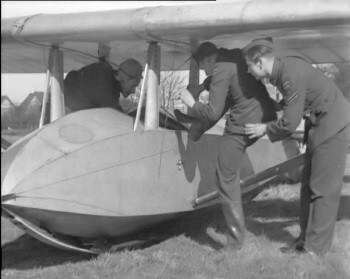 In 1932, at Ireleth, near Barrow-inFurness, Slingsby, piloting the “Falcon”, put up the greatest number of flying hours for any individual machine of the meeting and G.M.Buxton used the machine for his record distance flight from the site to Lake Coniston, gaining the Wakefield Trophy for that year. The machine was later taken over by the London Gliding Club. In 1933 other machines of the “Falcon” type were produced, one was purchased by Mr. C.E. 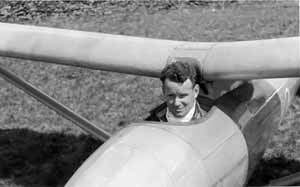 Hardwick, of Birmingham, a well known pioneer of gliding in this country. In the same year many primary and secondary types were produced, and Mr. C.E. Hardwick commissioned Slingsby to design and produce a two-seater sailplane. The result was the well-known “Falcon III” side-by-side two-seater, which was designed through-out and in detail by Slingsby during the winter of 1933-34, and was approved by the B.G.A. as in accordance with the standard strength requirements laid down by the Technical Committee of that association. 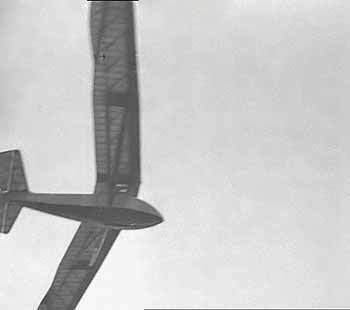 This machine, the first side-by-side sailplane to be designed, showed remarkable results and became very popular. In the meantime, the demand for gliders and sailplanes increased rapidly and larger premises were required. Slingsby then joined an engineering firm at Kirbymoorside and opened an aviation department, renaming the firm Slingsby, Russell & Brown, Ltd., with Major J.E.D. Shaw, Welbum Hall, Yorks, as Chairman of Directors. In 1935 the now famous “Kirby Kite” was designed, produced and flown in 4 months, and on its first soaring flight during the B.G.A. 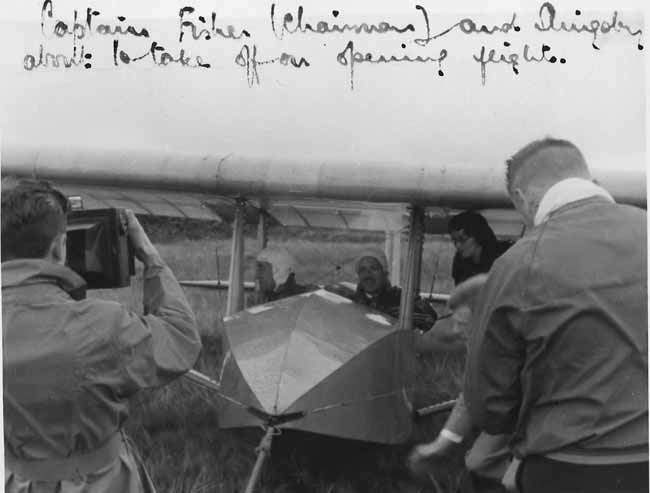 competitions at Sutton Bank, was flown by J.C. Neilan to Roose, near Withernsea, a distance of 55 miles. In the same year a high performance sailplane designed by G.M. Buxton was built by Slingsby and flown by Mr. P. A. Wills in many competitions and meetings. Mr. Wills, now our leading British Sailplane Pilot, put up a series of records on this prototype. Slingsby Sailplanes were now being sent to many countries in the Empire, and the demand steadily increased. In 1936 the firm designed and produced the “Kirby Cadet” and” Tutor”, both very useful and robust secondary trainers. Primary trainers were produced at an astonishing rate and at an equally astonishing low price. 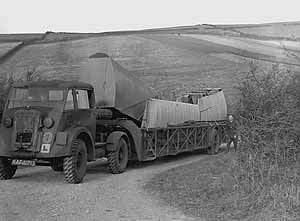 German competition, backed by an exchange rate beneficial to German exporters, kept the selling prices of gliders and sailplanes down to starvation rates, but in spite of the uphill struggle the firm lived and continued to sell machines to all the well-established gliding clubs. In 1937 the “King Kite” was designed by the firm under the supervision of G.M. Buxton. Three were produced before flight tests or any development work was carried out. These machines were entered for the International Competitions for Motorless Flying in Germany. The “King Kite” was a new departure and years ahead of its time. Pilots more at home with flying speeds of 35 m.p.h. and low stalling speeds were not entirely happy with a machine flying at about 45 m.p.h. Moreover, although the design was excellent, the lack of time for development work and the rush to complete the machine, resulted in wing jigging errors which were repeated in all these prototypes, and the error was not discovered until some considerable time after the competitions. Two of these machines are still in existence, and one is giving good service in the A.T.C. It is used for practice flights by certain Instructors, who speak highly of its performance and responsive controls. 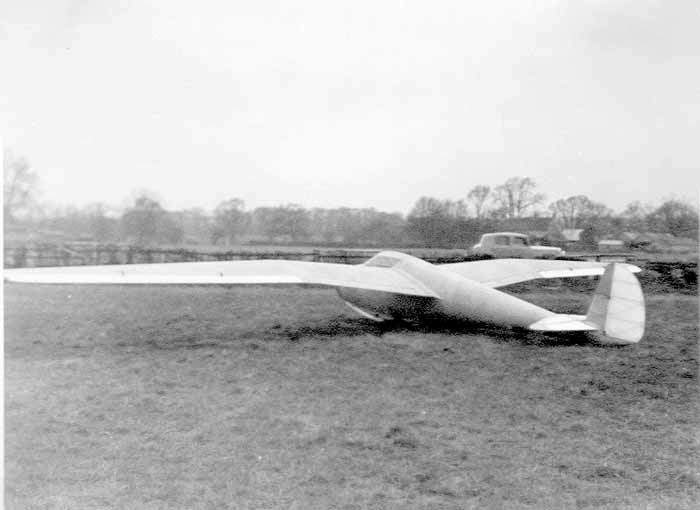 During the winter of 1937 Slingsby designed and produced the strutted “Gull” high performance sailplane. This machine has special characteristics and was designed for cross-country flying in high wind conditions. The prototype made its first “public” appearance at Radcliffe Aerodrome, near Leicester, during the successful Easter meeting of 1938. After a demonstration flight by Slingsby, the machine was purchased on the spot by Mr. Dudley Hiscox, who, in his usual business-like manner, immediately put the machine through its paces by a modest cross-country flight of about 60 miles to Bicester. Several machines of the “Gull” type were sold in this country and abroad. One, known as the “Blue Gull”, owned by that remarkably enthusiastic pair, Messrs. Greig and Stephenson, made the first genuine soaring flight from England to France. Stephenson, after a winch launch at Dunstable, flew to the South Coast, and with lots of height in hand, tackled cumulus cloud coming out at about 6,000 feet half-way over the Channel. He wisely continued his southerly cource and landed at a remote spot about 40 miles from an aerodrome in France. How he got back is another story. At the end of 1938 the firm was supplying and servicing sailplanes and gliders to every club in the country and many clubs and owners overseas. Business was brisk in spite of German activities. Primaries, “Kirby Cadets”, sailplanes, were being produced in a steady stream. The late Frank Charles, the well. known dirt track rider of that time, already the owner of a “Kirby Kite,” which he handled in a masterly way, persuaded the firm to build him a machine with “Rhonadler” characteristics, but with more up-to-date features. This machine was named by Charles the “Petrel”. The “Petrel” was a winner from the start, and four more were built, two with a stabilised tail unit instead of the pendulum type of elevator. 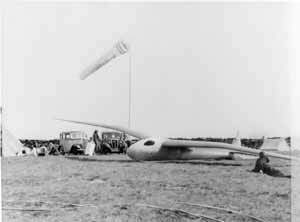 In 1939 the production of sailplanes and gliders became an established industry, and the firm felt justified in forming a separate company, “Slingsby Sailplanes Ltd,” and built a new factory at Kirbymoorside. War broke out the day before the factory opened and all orders were cancelled. However, the factory carried on and finished its experimental types, which included a full cantilever wing version of the “Gull” and a two-seater high performance cabin type sailplane, the ” Gull II”. In 1940 the “Kirby Kites” were taken over by the R.A.F for special duties, and later a “Petrel” with J.C. Nielan as pilot, was detailed for similar work. The factory gradually became involved in war work, and sports gliders slowly faded out of the picture and bigger and grimmer craft appeared. In 1941 the A.T.C. 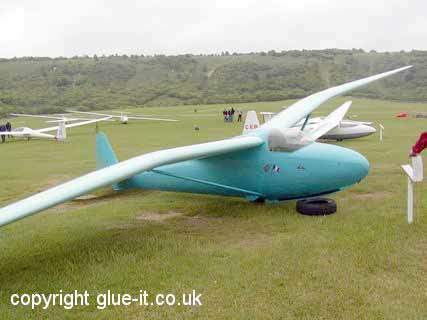 went glider minded with a scheme for encouraging its youthful members to build their own gliders. The firm loaned a set of “Kirby Cadet” drawings to the A.T.C. authorities to help the good work. Later firms commenced building the machines, and the “Kirby Cadet” is now the standard training machine for the A.T.C. Gliding Schools. The post-war version of the “Petrel” high performance sailplane has additional features such as landing wheel, adjustable rudder pedals, tail trimmer, and a choice of two cockpit covers. The single-seater “Gull” will be produced with a full cantilever wing, landing wheel, tail trimmer, adjustable rudder pedals of our own design. The prototype version has shown remarkable results which are well ahead of any other machine of the 50-feet span class. The performance of the strutted “Gull” is well known to all leading pilots; an increased performance is assured. Two trainer type 2-seater sailplanes have appeared from nowhere in particular. These are known as the Type 20 and Type 21. (Shown Below) Prototypes of both machines have logged many flying hours and promise to be valuable additions to post-war training equipment. An entirely new elementary training machine is under design consideration with special features for rapid replacement of damaged parts, simple construction and large scale production. A very large batch will be made as soon as labour and materials are released for this purpose. Quantity production will ensure lowest possible selling prices and the prompt supply of spares. A few machines of the ” Meise ” Olympia type are also on our programme for production as and when materials can be released. The cantilever “Gull,” however, will have a better performance. Within a few months of removal of restrictions, machines of all types will be available to clubs and private owners. A Yorkshire glider manufacturing company, at present in the hands of a Receiver, is to become part of Vickers Shipbuilding Group, based on Barrow. and the deal may result in the more rapid development of techniques for using glass and carbon fibre reinforced plastics in shipbuilding, al- ready the subject of experiments at Barrow Shipyard. Vickers announced today that they were acquirjng the manufacturing and property assets of Slingsby Aircraft Ltd., of Kirkby Moorside. A new company, Slingsby Sailplanes, was being formed, and would concentrate on the design and development of sailplanes and the development of glass and carbon fibre units. No announcement has been made about the cost to Vickers of the acquisition, but a company spokesman at Barrow said a figure of £200,000 quoted in national newspaper reports was wide of the mark. 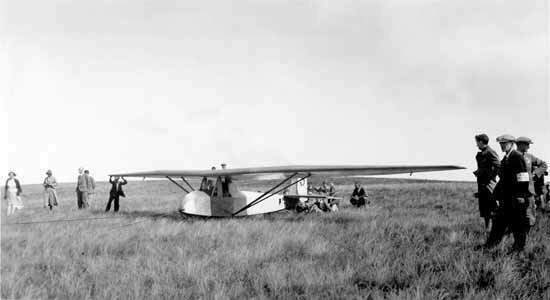 Slingsby Sailplanes, as part of the Vickers group. will collaborate with the West German firm of Glasflugel, who manufacture two successful high-performance fibreglass sailplanes. Managing director of the new company is to be Mr. George Burton, of Marlow, Buckinghamshire, a physicist and Britain’s leading glider pilot. Mr. Burton has experience at both Farnborough and Harwell. The general manager will be Mr. W. Slater. The Vlckers spokesman said that Slingsby had been one of Kirkby Moorside’s biggest employers, and it was hoped that the company would be built up so as to return to its former position.